Oh, the frustrations of being a Ranger fan, what a cross we have to bear. If the Rangers were capable of playing at the level that they did on Monday night, why the hell is this series going to seven games? 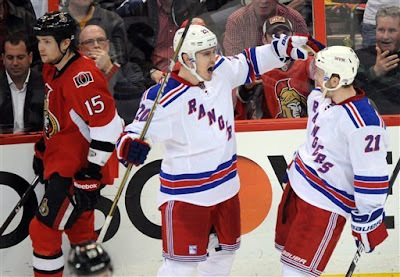 The Blueshirts put together a terrific performance to top Ottawa 3-2 to level the series at three. The boys were physical, they were smart, they were resilient, they were a first place team. It was one of the rare times this season that all elements worked efficiently: their best players were their best players and there was secondary scoring, solid special teams and incredible defense. Things just worked. And it was wonderful. And now they have a chance to do it again on Thursday. And they had better do it again on Thursday. *Love the Code, it is one of my favourite things about our sport. Prust hits Karlsson, Neil hits Richards in response. 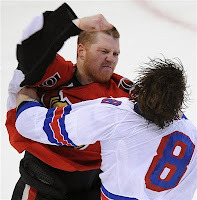 Prust then fights Neil. You hit ours, we hit yours, time to dance. Bloody beautiful. *That fight though ... that wasn't pretty. Poor Pruster is clearly not the pugilist he was before the Krys Barch fight broke everything that was fixed in his offseason shoulder surgery. But, as he has said, "it's just pain." After a string of underwhelming performances to start the series, Prust was a huge factor for the Rangers in this one. He and Rupp came out hitting and his fight against Neil signalled that the Rangers weren't ready to quit this series. *Alfie! Alfie! Alfie! Invisible, except when being hit by John Mitchell of all people. Check that: except when being hit by Mitchell and when being stoned in front by Hank. That save by the King, with the game tied at one, was MASSIVE. If Alfredsson scored the go-ahead goal in his first game back, the roof would have blown off that building and it would have been all-but-impossible for the Rangers to recover. *Mitchell on the power play? Mitchell on the penalty kill? Mitchell holding blackmail photos of Torts' wife. Well ... maybe not, but how do you explain it? *Welcome back Hagelin. A nice, simple, tenacious performance. Bork! *That Senator Silfverberg has a big future - looked a lot like that Nyqvist kid on Detroit. What is it with the influx of young, skilled Swedish forwards? Put him out there with Karlsson, Bishop, Stone and Zibanejad in the next few years and Ottawa could be really dangerous. *Ever since people decided they needed third parties to mediate their sporting events there have been fans who have disapproved of the actions and decisions of those third parties. And when those decisions directly affect the results, well those fans voice their disapproval. This is me voicing my disapproval: Tim Peel needs to be relieved of his duties. You never want to see someone out of work, but officiating NHL hockey is clearly not something he is capable or competent of doing so he should be banished to the unemployment line. The calls throughout the night - on both sides - were not dubious, they were egregious. *The USA! USA! chants at the Garden will finally be appropriate on Thursday when Step, Kreider and Callahan take the ice. The three all-American boys worked quite well together for enough shifts that they deserve a shot to stay together despite Torts' tendency to juggle lines. And, riffing off the U.S. aspect of it, it seemed like Step finally realized that 'a bruise on the leg is a hell of a long way from the heart.' The kid was playing at a level unseen from him this series to be sure. *And congrats to Kreider: right time, right place, perfect release. *Del Zaster had two of his better moments as a Ranger. First he made an outstanding keep-in on the Richard$ goal, then he lined up Neil with a hit. Sure he barely made contact and Neil milked it as much as he could, but seeing that Sen rolling around was outstanding. It was a nice measure of revenge after DZ left Staal outmatched in front on the opening goal of the game. *Dubi picked up some of Boyle's ice time and most of his faceoff duties. He proved capable, but little more. This kid used to tease an impressive combination of size, power and hands and now he is little more than a third line plug. Kinda sad. Really woulda been nice if he could have helped Cally convert one of those shorthanded breaks. *Pretty sure I saw Konopka get away with a clear headbutt on Rupp in the first period, just before he got hung for the ridiculous roughing call. Rupp, by the way, played three more shifts in the first, none in the second and just one in the third. He really had his legs for that one in the third, let me tell you. And he came out of the gate flying - well, as close to flying as Rupp gets. *Two minutes for Stu? Really Torts? Can't deny that McDonagh did utterly phenomenal work in his extended minutes - minutes he pretty much needed to play - but keeping Bickel benched for so long only hurts the team in the long run. 3-Chris Neil - one goal. 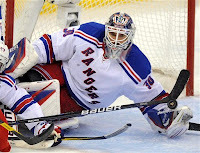 2-Henrik Lundqvist - 25 saves. 1-Derek Stepan - one goal and two assists. 3-Richard$ - Hey, there is that power play quarterback we were promised! 2-Neil - The only thing that didn't work for him was his act behind the net. Hate him so very much, which means he is doing his job so very well. 1-McDonagh - Step collected a few points and the King came through with a few big saves but McD was a rock all night long (all night). As Girardi has faded ever so slightly since the All Star Game, McD has raised his game to another level. Love you Bob Gainey! 51-22-7: You Can't Beat Us!!! !